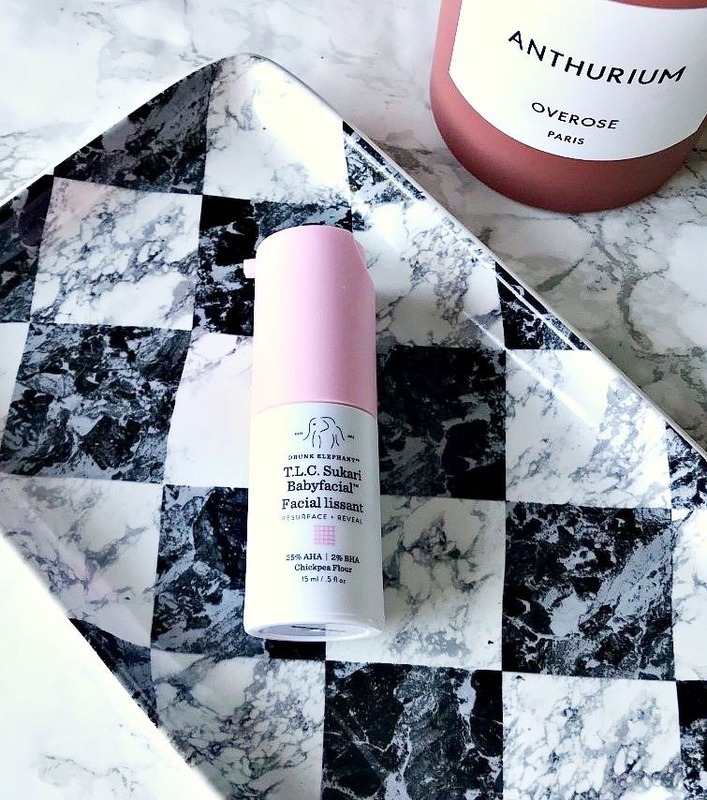 Earlier this year when I was in New York, I bought two mini sets of Drunk Elephant products and had mixed thoughts on them but it was still a brand that I was eager to try more from, specifically their Babyfacial that so many people rave about but when Drunk Elephant launched on this side of the Atlantic, this was the one product that didn't arrive! This is due to it being a blend of 25% AHA and 2% BHA, which is higher than EU rules allow. However, it can be bought on Amazon or I bought mine from Sephora. Drunk Elephant T.L.C. Sukari Babyfacial is a peel mask that contains a blend of acids: glycolic, tartaric, lactic, citric and salicylic, which combine to exfoliate the skin, reduce pore size, improve texture and elasticity. Sounds like a miracle product, right? It is designed to be used only once weekly with an even layer applied to clean, dry skin. After 20 minutes, it is removed and it's recommended that you follow with Drunk Elephant Virgin Marula Luxury Facial Oil but realistically whatever oil you normally use will be fine. The instructions say that some mild tingling may occur but I personally didn't experience any tingling at all - that being said, my skin is pretty accustomed to chemical exfoliators so if you are new to acids when trying this, you probably will experience some tingling and may want to build up to leaving it on for 20 minutes. The first time that I used this, because I didn't feel any tingling, I (wrongly) assumed that it wasn't doing anything to my skin but when I removed the mask, I was shocked by how soft and smooth my skin was. I followed with the Virgin Marula Luxury Facial Oil because a mini tube came with the Babyfacial and my skin felt amazing. The effects have been the same every time I use it and my skin feels soft and smooth for days afterwards. I love the results so much that I'm only short of asking strangers to stroke my face to feel how soft it is! I have noticed a difference in the texture of my skin too - it feels so smooth and my pores are refined, also fine lines on my forehead are diminished. Everyone! I think that everyone would see the benefits of this mask from the very first use but over time, scars fade, pores are less visible, skin is clear and bright and texture improves. Also, who doesn't want baby soft skin? This product 100% lives up to the hype. It's expensive and hard to get hold of this side of the Atlantic but it really works. If your skin is dull, spotty, uneven, porous, dry, scarred or just in need of a boost, you would love this product! Have you tried Babyfacial or any Drunk Elephant products? I'd love to hear your thoughts?